Democrats immediately shot down Mr Trump's Saturday offer to restore protections for young immigrants known as "Dreamers", because it still included $US5.7 billion ($A8 billion) for a border wall. Mr Trump's greatest foe, Speaker of the House of Representatives Nancy Pelosi, called the offer of temporary protection for about a million undocumented immigrants a "non-starter". Democrats are unwilling to fund Mr Trump's wall, but his proposal increases the pressure on the party, which says it will not negotiate until the government is reopened. 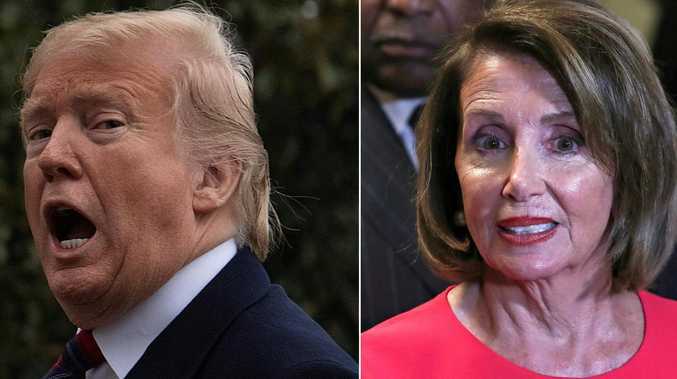 The US President went on the attack after the Democrats turned him down, criticising Ms Pelosi for acting "so irrationally" and being a "radical". 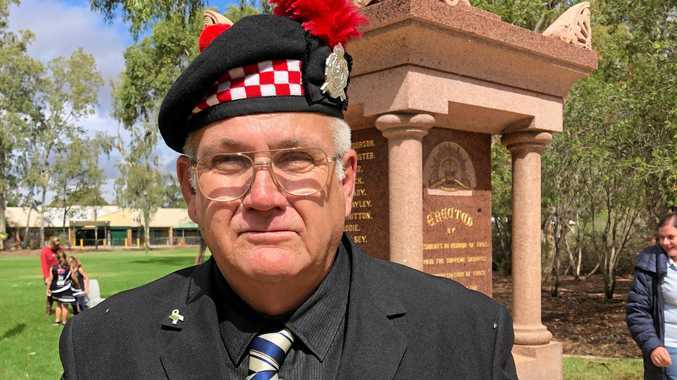 He said his opponents should "do the right thing for the Country & allow people to go back to work." Senate majority leader Mitch McConnell will bring up legislation as early as Tuesday, containing the President's proposal plus billions in disaster relief. Neither is likely to get their legislation passed, but the President's offer marks a turning point, after he previously refused to extend protections for Deferred Action Childhood Arrivals, who entered the US as children, and those with Temporary Protected Status because of crises in their home countries. Polls show most Americans blame Mr Trump for the shutdown, after he told Ms Pelosi and Mr Schumer he would be "proud to shut down the government for border security" in December. "I will take the mantle," the President said at the time, but he has since changed his stance, holding the Democrats responsible for refusing to agree to pay for his wall. "They don't see crime & drugs, they only see 2020 - which they are not going to win," he tweeted on Sunday. "The President is very much aware he's losing the public opinion war on this one," a senior administration official told the Post. "He looks at the numbers." Lady Gaga on Sunday paused her Las Vegas show to demand "that the f***ing president of the United States could please put our government back in business." She added: "There are people who live pay cheque to pay cheque and need their money." The President's advisers have been looking for a way out, according to US media reports. Mr McConnell told Mr Trump, Mr Pence and White House aides last week that they needed to put forward a public offer. "Amnesty will be used only on a much bigger deal, whether on immigration or something else," Mr Trump reassured his voters. 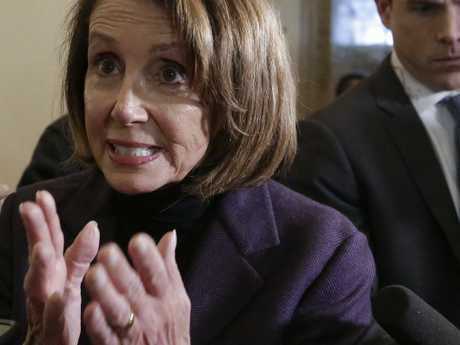 "Likewise there will be no big push to remove the 11,000,000 plus people who are here illegally - but be careful Nancy!" Ms Pelosi hit back: "Re-open the government, let workers get their paychecks and then we can discuss how we can come together to protect the border." House minority leader Kevin McCarthy said Mr Trump had put forward "a serious and reasonable offer to reform parts of our broken immigration system and reopen government" and that "the moment now turns to Nancy Pelosi and Chuck Schumer." It seems clear Democrats will not agree to fund a $US5.7 billion wall, but Vice President Mike Pence suggested on Fox News Sunday that Mr Trump's proposal could be amended on the Senate floor. Mr Pence told CBS's Face the Nation the proposal "provides a framework for ending this impasse", citing Martin Luther King Jr's famous quote the day before MLK Day: "Now is the time to make real the promises of democracy." The vice president was criticised for invoking the civil rights leader, whose son shot back that his father "was a bridge builder, not a wall builder." Mr Trump and Mr Pence made a six-minute, unscheduled visit to the Martin Luther King Jr memorial on Washington's National Wall on a bitterly cold Monday morning. They placed a wreath and Mr Trump briefly addressed reporters, saying it was a "great" and "beautiful" day but not directly mentioning MLK. He also ignored questions about the shutdown. "McConnell's view of shutdowns is when you're in one, it's a great opportunity for both sides to get things," Republican strategist Scott Jennings told the New York Times. "And what I think is dumbfounding everyone here is: Why aren't the Democrats treating it as a situation where they could get something? The President has opened the door for them to get something, so let's talk." "He's starting to move the pieces around to see what's going to fly and what's not going to make it," Democrat Jim Manley told the Times. "He's trying to put the pressure back on Democrats, and he's trying to see what the possibilities of a deal are by putting a larger package there. He's trying to see how large the package has to be to bring Democrats on board." Republican pollster Neil Newhouse told the Post the situation was "a national game of chicken." Mr Pence, Jared Kushner and acting White House chief of staff Mick Mulvaney are all working hard on the President's behalf to push through a deal. GOP strategist Michael Steel told the Post the shutdown had become "a test of strength between the president and Washington Democrats" and its conclusion would be an indication of how well the broken relationship may work over the next two years.